I used to watch a lot of "I Love Lucy" as a child, and you know the scenario. Lucy and Ricky sit in their separate beds having a light night/early morning conversation before turning out the lights and sleeping in their respective beds. 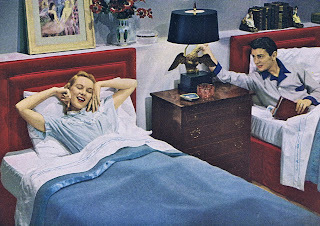 It seems old fashioned, but there are some who would argue that it is a very modern solution to an age-old problem: a better night's sleep for the married individual. It's something I have never really considered, but science shows that women in particular get a better night's sleep when they sleep without their partners... the ironic part? The women don't actually feel that they get a better night's sleep because many report enjoying sleeping next to their partners. You can read the full article by CLICKING HERE. But whatever, this article came out and it was the same week that the cat decided to sleep in the bed with us. I already have a 15 pound dog that sleeps between my legs, so, nothing against my cat, Mr. Blue, but space is at a premium. It wasn't as though he wanted to sleep on my husband's side--no, he wanted to be with me exclusively. This left me about 2 inches of sleeping space. Couple that with the fact that my husband always seems to be encroaching on my side of the bed while simultaneously complaining about the fact that I am hogging all the bed space and I was ready to take a chainsaw down the center of the frame. Separate beds? YES PLEASE! But the reality of the situation is that I would be loathe to sleep in a bed by my lonesome. When my husband is gone, I toss and turn... sure, I've got plenty of space to do it in, but the tossing and turning is not a welcomed bedmate. Perhaps, if I were Lucy and Ricky style (in the same room) that I could sleep better. I'm just not that sick of my husband yet. If I reach that point, I'm more likely to just have him set up his own bedroom in the house rather than share one with me at all. According to this study, it can work wonders for a marriage. While I can see the possibility, I am still or just not yet entirely sold. I love the closeness of sleeping side by side mostly because I enjoy the comfort of waking up with one another. Yea, I'm into that cheesy morning time stuff. I enjoy that I can reach over and touch my husband... or wake him in the middle of the night for a little nookie. I enjoy sharing my much too crowded bed, even if it means that I don't sleep as well in the end. Perhaps the real solution should not actually be two small beds, but one big California king bed!! !